It is so tough to be a lady — especially an aging one. A friend recently confided that it is getting harder and harder to get herself out of the door because she has to do so much work in front of the mirror to keep herself looking presentable. While men become distinguished with their fine lines and gray hair — women don’t. So, ladies, I say, do whatever it takes. And one area that can use help is by coloring or bleaching your hair. Personally, I think solid gray hair is stunning — it’s like God has finally blessed us with the glowing halo we finally deserved. I especially like my friend’s hair, who has very dark hair, with streaks of silver coming through — don’t touch it — let those angels hairs light up your face like a halo. It’s like she’s half- angel and half human… her feet still touching the earth, and it just makes me treasure her all the more while she’s here. But for those of who don’t have the kind of hair that lends itself to carrying off the half-gray look, which looks more like a mouse, than a halo — there is color and bleach. But, alas — bleach causes hair damage. Professional stylists will tell you to condition, condition and condition your hair bleaching — and even the at-home bleaching kits include an extra pouch of conditioning to help the process along. But it’s futile. The damage has already been done, and at this point — it’s too late to “fix” your hair. It’s what you do before the bleach is applied that’s the key. But, there is a better way — and I’m not sure why this isn’t common knowledge among all hair-care professionals, as the scientific research to support it has been out, since at least 2003. The problem with bleaching is that the process reduces the amount of protein in hair, which leads to breakage. 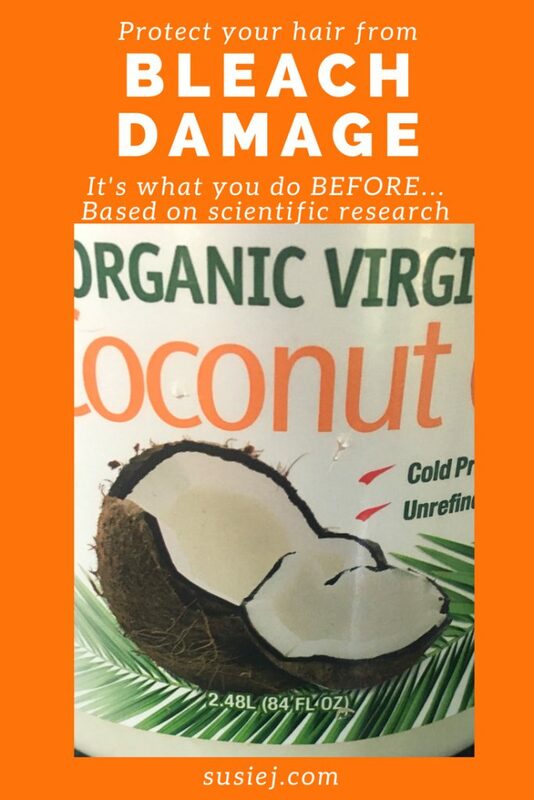 Researchers found that Coconut oil, as a triglyceride of lauric acid, has a high affinity for hair proteins with a low enough molecular weight to penetrate inside the hair shaft. All of the news that’s flying around about the benefits of coconut oil are not hype. Coconut oil can protect your hair from protein damage better than any other oil. However, there is a keyword in the research — Prewash. Covering the hair cuticle with coconut oil to prevent damage is key — especially when bleaching your hair. Applying the oil after the bleaching is done, might be too late. The word “wash” is misleading — when you apply the coconut oil on your hair, it should still be on your hair when the bleach is applied. 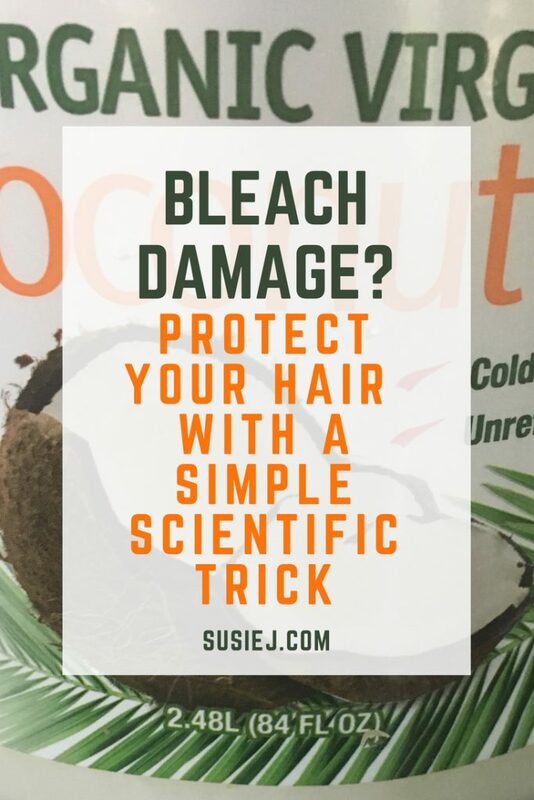 So, apply the coconut oil, let it penetrate the hair, for at least an hour or two — and then apply the bleach, with the coconut oil still on your hair. While the research does not specify how much coconut oil to apply — the key is to saturate the hair shaft. Yes — the bleach and color will “get through” the coconut oil. But, your hair will not be damaged. If you want to see it in action, check out this list of Youtube videos of ladies demonstrating this scientific fact in action. The trick is getting the coconut oil “out” after your done coloring and washing your hair. So, the next time you head to the salon for a bleaching, arrive with a greasy head of coconut-oil laden hair. Your hairdresser will laugh — and just share the research. This is also perfect for those of you who want to add a few highlights with Sun-In, safely at home.